Nestled in the lush hills of Malaysia’s northwest Perak state is the sleepy town of Ipoh, once the centre of one of the world’s biggest tin mining communities. The most prominent, and a de facto ancestral home of the Hakka Miners’ Club, is the Han Chin Pet Soo building, which is now a museum that seeks to bring the town’s past back to life. The museum is operated by a heritage preservation charity called Ipoh World, founded by British Royal Navy commander-turned-archivist Ian Anderson. As news of the project spread, photos, artefacts and documents poured in. Anderson’s project grew into an archive of about 8,000 articles and 14,000 digital documents, including photos and scanned archival resources, all of which can be found on his website. The materials have been a source of several exhibitions at Han Chin Pet Soo. The museum also tells the story of the building itself, starting with the founding of the Hakka Miners’ Club in 1893 by an immigrant from China known as “Towkay” Leong Fee (also known as Liang Pi Joo). Leong, a native of Guangdong province’s Meixian district, arrived in Malay in 1875, according to Ipoh World’s archives. Leong crossed paths with some of the most important figures in Ipoh’s economic and social history: Yau Tat Shin, widely credited as a key developer of the city; the aristocratic Dato Panglima Kinta Yusuff, who helped steer the growth of Ipoh in the 1880s; and various European businessmen and tycoons who passed through the Straits Settlements. The “four vices” of the time: drinking, gambling, (opium) smoking and prostitution. 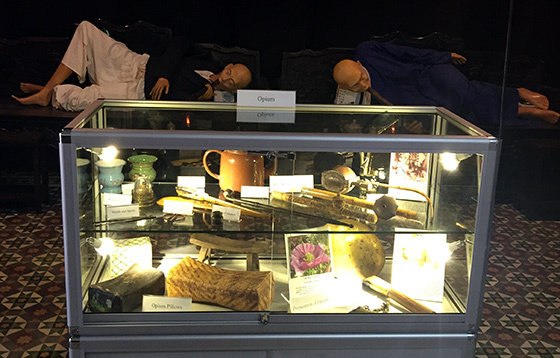 Opium artefacts. Many Chinese Malaysian great, great grandfathers were opium addicts. During the tin boom, Ipoh was a valuable jewel in the British colonial crown, and its history charts the rise and fall of the empire itself. By the end of the 19th century, the Straits Settlements of Southeast Asia, controlled by the British East India Company, supplied a little more than half of the total global tin output and contributed greatly to British tax revenues. The rapid growth of Ipoh and its strategic importance to the British Empire ensured it became Malaysia’s first city after the capital, Kuala Lumpur, to be hooked up to an electricity grid. The Hakka today represent the third-largest Chinese dialect group in Malaysia, after Hokkien and Cantonese. Unlike in neighbouring Penang state – whose residents have a strong tradition of preserving their largely Hokkien culture – Ipoh lacks the community spirit and cultural pride to continue defining the meaning of their identity in the modern era. That lack of community spirit and cultural engagement may threaten Ipoh World’s work at Han Chin Pet Soo. Anderson says funding to meet costs is a major issue for the charity, and he is uncertain how long he will be able to rely on the good graces of his patrons. “I lose money here every week,” he says. The organisation needs 2,000 to 3,000 Malaysian ringgit (US$510 to US$770) a month to keep running, and Anderson says an entry charge is not an option. At the moment, the donations he receives are not even enough to keep the lights on, he says. [An excerpt of an excellent article by Samantha Cheh, SCMP. Ipoh is my beloved hometown. I am 5th Generation Hakka from Tsang Sing ancestral village near Guangzhou, Southern China. Now I’m simply a Malaysian. I left my parent’s Ipoh den to further my studies at St. Kevin’s College, Toorak, Melbourne. I have many fond memories of Ipoh and my alma mater St. Michael’s Institution, Ipoh, and the crazy antics of my Michaelian Standard 6B primary school classmates (we created a wonderful super-active Whatsapp group 2 years ago). I treasure my extracurricular activities with the Valiant Vanguard Movement. I loved the weekend Vanguard Training Camps in various towns. Those were the days of old-fashion pen pals, innocent teenage puppy love romances and crushes, accompanying and walking a cute girl home while pushing my bicycle along, a few hours long fixed-line phone conversations (‘bou teen wah chuk’) with my girl friend… yeah, no internet distractions, texting, or mobile phone Phubbing. The Vanguards and Ipoh were the catalyst for my passion and purpose in learning & development, coaching business, leadership, spirituality & Afterlife, youth CSR, and other activist initiatives.